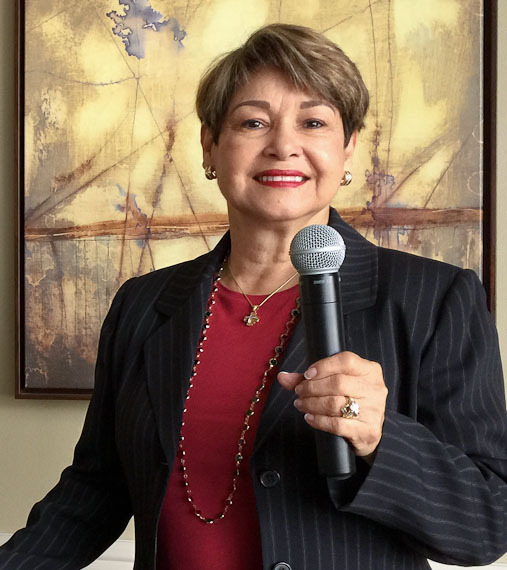 Pola Hansberger, the Founder of Legal Immigrants For America (LIFA) and a legal immigrant from Nicaragua, shares her story. I’ve called the United States of America my home since the age of 18 years old. In all those years we in the USA have celebrated Dr. Martin Luther King for giving a voice to the voiceless though he did not represent the legal immigrants. We’ve celebrated the message of Democrat Congressman Luis Gutierrez of Il. ; of Rep. Gov. Jeb Bush, Senator Rubio, and of today’s Speaker of the House Paul Ryan but they do NOT represent the legal immigrants. For years we’ve heard from representatives of La Raza, Univision, Telemundo all of them for giving “rights” to illegal foreigners and for the taxpayers to give benefits to them. Benefits never offered to our veterans, disabled or poor. They did not represent the legal immigrant. Neither Democrat nor Republican politicians have ever spoken about us, the traditional legal immigrant that came to our country legally; the ones that wouldn’t dream of asking for stipends or any other benefits from the taxpayers. The ones that had to work hard, learn English, work, pay taxes, like any other natural born citizen, to become part of the fabric of our society. My question to them is: Who was it that has lived in the shadows? Is it the well represented, glorified, demanding, and spoiled illegal foreigner whom they, by changing their name, from “Trespasser and Law Breaker” to “Dreamers or New American” expect the rest of us, law abiding citizens to welcome with open arms. They were getting away with it. No one dared complain, until Candidate Donald Trump became the pro-USA Spokesman. Others immediately followed like Ted Cruz and Dr. Carson and went up on the polls. Since then things have changed dramatically. Today, immigration is one of the top topics of discussion in politics and the one issue that can make or break the aspirations of a presidential candidate. Even Democrat Hispanics, are listening to Donald Trump’s message today. Who wouldn’t want a president that would “Make America Great Again”? We all do. The desperate Republican candidates that thought they’d win the Hispanic vote by embracing the Democrat’s anti-American policies of a borderless USA have been caught by surprise and are dumbfounded. Their joining the Obama’s team to transform the USA into a third world country, one that invites, brings to the US by plane, and gives preferential treatment to the indigent population from south of the border and the Middle East at Taxpayers expense, has not produced the desired results. Meanwhile Trump continues to climb in the polls. Could it be that there are millions of legal immigrants from Latin American countries and from all over the world that love the United States of America? That they want their children and grandchildren to inherit the country they migrated to? We have been ignored so many years they really think we don’t exist. In spite of the fact that the leftist Spanish Media has had tremendous success in brainwashing the Hispanics with their anti-American propaganda that would make Carl Marx proud, they are underestimating the intelligence of Americans of Hispanic descent. For the most part they are Christian, love God, family and country. They love the freedoms and opportunities they’ve enjoyed in this country and do not like how this administration is looking like the countries they left behind. I’m respectful and obedient to the rule of law of any country. It was the United States of America that adopted me as her child. It was the American citizen that made me feel at home in their country. Finally, it was the United States of America that provided my wonderful husband! A WASP. In my career with Pan Am I found myself in beautiful countries and enjoyed everyone of them. All different and beautiful but, in my opinion, didn’t hold a candle to the United States of America. Most of the time, when I returned home from a long trip, I gave thanks to God for bringing me back home to the United States! Let me tell you: America the Beautiful is worth fighting for. To provide education and information about our country to immigrants and others via our website. To lobby locally and in Washington in defense of the institution of Legal Immigration and for the enforcement of our Immigration Laws. If we don’t change the Obama’s lawlessness, no one in the planet will ever choose to come to America legally. We’ll be the only country in the world that won’t know who is coming into the country. To illustrate the harmful effects of illegal immigration to all. Many do not know how it affects our economy and job market; how it diminishes the quality of education, medical, and Hospital services. Worst of all, how it threatens our national security as we saw in the San Bernardino massacre. To give immigrants and others the choice of how to evaluate our country from a Christian Conservative perspective. INSTEAD OF FEELING VICTIMIZED WE’D LIKE TO SHOW THEM HOW BLESSED THEY ARE TO BE AMERICANS! My country of birth was Nicaragua, when I, and two of my sisters came, it was a peaceful and a nice place to live, we thought. The purpose of our trip was to learn English and go back. However, we were told at the US Embassy that if we wanted to work we should apply for our residency and enter as legal residents. Our parents thought that was reasonable and we proceeded to follow the instructions given to us. Less than a year later we arrived at the Los Angeles Airport and were picked up by a friend. What an amazing sight that was to us. We were awestruck by the architecture of the airport, the freeways, and natural beauty of the San Bernardino snow peaked mountains visible from Los Angeles. We got excited with the adventure of being in the United States and couldn’t wait to learn English and make friends! We looked forward to exploring and touring the many exciting places there! Hollywood, the beaches, museums, parks, restaurants. Oh, my! We came in November so we were invited to go see the first Thanksgiving Parade in Hollywood, California! I remember having to climb on the cement base of a lamp post to see it better. We were awestruck! Our friends saw how impressed we were with that Parade so they took us to see the Rose Parade in Pasadena on the first of January. After that we called home to Managua and had no words to describe the beauty of it to our parents. Soon after our mother came to visit us. When she went back to Nicaragua she promptly went to the American Embassy to start her process of becoming a Resident. If Communism had not happen in Nicaragua, our parents would’ve sold everything of value and moved to the United States to be near us. For the three sisters, life in the United States continued to this day to offer delightful experiences. My residing in different states such as California, Hawaii, Illinois and Florida has been wonderful. Have we had trials and tribulations? Of course! But the worst one was the Communist takeover and transformation of Nicaragua. In 1979, the Russians invaded Nicaragua and helped the Sandinistas win their war. Our parents lost all of their assets. The Sandinistas helped themselves to their real estate which was their source of income in their senior years. The currency lost most of its value SO THEY LOST THEIR SAVINGS, TOO. A bomb fell in our oldest sister’s family home in Nicaragua. The next day all six members of the family took an airplane to Los Angeles to seek political asylum. They had packed one suitcase in a hurry and left all behind. We helped them start their process of immigration immediately. It took close to seven years for all of them to get their residency but they were given permission to work in the meantime. The youngest child was 8 years old and the oldest was 16 when they came. Today, they are productive citizens, married to Americans and raising families. The Communist lie of wiping out poverty by redistributing the wealth of “rich” people to resolve the income inequality, and bringing “SOCIAL JUSTICE” to all, is a huge lie. People fall for it, many countries around the world have had the misfortune of turning Communist/Marxist/Socialist with horrible consequences. Americans do not believe that it could happen to us or they would be protesting in the streets. The consequences of what happened to our parents were traumatic, for it did not end up there. I could write a book about it so I won’t take the time. Just let me tell you that I did not abandon my parents and went to Managua as often as I could. Pan Am would stop there on the way to other destinations, drop off the mail and take off again. I was allowed to get off the airplane but there were times when the passengers I sat and chatted with during the flight, would look outside the window, got scared for me, and would beg me not to get off the airplane. There were Russian Airplanes, soldiers, and weapons everywhere in the Managua airport. God certainly took care of me for I am here telling you the story. AFTER THAT EXPERIENCE CAN YOU UNDERSTAND WHAT MOTIVATES ME TO FIGHT NOT TO LOSE ANOTHER COUNTRY AGAIN? There are plenty of reasons to be alarmed at what is happening to the United States today. But what alarms us the most, is how easy it is for our citizens and Congress to accept the changes and loss of unalienable rights without protest. It’s scary to me how well educated and successful people do not see the dangerous signs. Some have made no bones about telling us that we are exaggerating and do not have a reason to worry. It doesn’t bother them that our children are going to school and universities to be indoctrinated. They are unaware that our young are not learning the truth in American and World History. It doesn’t bother them that our children are being corrupted by exposing them to things our parents and grandparents would’ve been too embarrassed to bring up in conversation. Bright children go to Universities to fall in the hands of professors like Bill Ayres, who taught at the U of Illinois, or his wife Bernardine Dohrn who taught at Northwestern U. They were part of the Communist group “The Weather Underground” that bombed the World Trade Center and other government facilities in the 60’s and instead of being in jail, are trusted to teach our young. Obama and his administration is a friend of the above professors and many more like them at many prominent Universities throughout America. People like Jonathan Gruber at MIT, who created ObamaCare and admitted he had lied to the American people for we are too stupid to be told the truth. That’s how they have been successful in implementing their Marxist and Islamic Agendas. Let’s hope our next president will have the energy and the political INCORRECTNESS to tackle this issue. We know that most politicians have been afraid to speak up not to trigger a merciless attack from the left, for defending our nation. Donald Trump, Senator Ted Cruz and Dr. Carson are the exception to that rule and are the top tier candidates. Their success tied to their willingness to address the politically incorrect issues facing us today. The Syrian “refugee” disaster brings to light that Islam masquerades as a religion but is anything but peaceful. There is a law from the 1950’s that prevents the importation and entry to our country to people that intend to topple our government and institute theirs, such as the Muslims’ Sharia Law. One thing is for sure: Our Constitutional Republic cannot afford another mistake. We need to give back the power to “We the people of this United States” and elect a president that will respect our rule of law, the US Constitution and the will of the people. A president that can fight and will have the courage to implement remedies in every department. The DOJ, the IRS, The Veterans Administration, the NSA, the ICE, and RESCIND all of Obama’s unconstitutional and illegal EXECUTIVE ORDERS. The time has come for us adopted and natural born US Citizens to unite and work together to achieve the difficult goal of electing a patriot, USA lover to the presidency. Join LIFA BY going to www.golifa.com and if you have legal immigrant friends please have them join us, too. Your suggestions, donations and volunteering are welcome. We will forever be grateful, and hopefully our children and grandchildren will be grateful too when we save the USA. I’d like to remind you that in Florida people have to be registered Republican to be able to vote for a Republican candidate. Tell others the deadline is the beginning of February which is almost upon us. They need to go to either the Library or the Supervisor of Elections office and change their affiliation NOW. I wish you a HAPPY AND BLESSED NEW YEAR! AND MAY GOD BLESS THE UNITED STATES OF AMERICA!